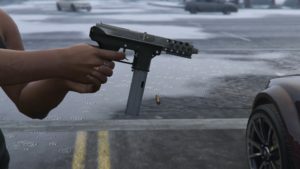 TEC is short for TEC DC-9, a semiautomatic pistol associated with criminals. Where does TEC come from? The Intratec DC-9 semi-automatic pistol was distributed between 1984 and 1994 by the Swedish gun manufacturer Interdynamic AB and its US subsidiary Interdynamic USA, later Intratec. 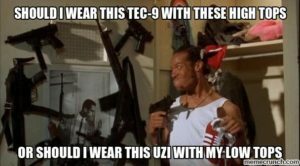 The TEC-9 was a redesign of the KG-99, a weapon deemed illegal by the US Bureau of Alcohol, Tobacco and Firearms (ATF) in 1985. Due to its bulk and poor accuracy, the TEC-9 was unpopular with gun hobbyists and professional shooters. However, its cheap price and large ammunition capacity made it very popular with violent criminals. Due to its intimidating appearance and firepower, the TEC-9 has been a popular weapon in film and television ever since its original production. It appeared in the 1980s TV series The A-Team, the 1986 film Big Trouble in Little China, and a dozen other films and TV shows in the 1980s and 1990s. It was still making appearances in the 2010s, used in Season 7 of The Walking Dead (2016), for instance. Of course, its popularity never slowed with violent criminals either. 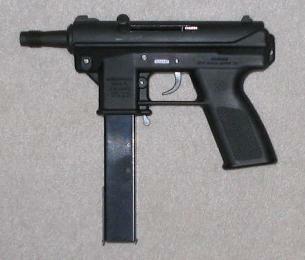 In 1989, a study declared the TEC-9 the single most common assault weapon among violent criminals. There was outcry by anti-gun lobbies to ban the weapon, which eventually happened in 1994, classed as a semi-automatic version of a military submachine gun. The gun became illegal to manufacture (but still legal to own) in the US, and Intratec stopped production of the weapon that year, replacing it with the AB-10. Intratec would go out of business entirely in 2001. 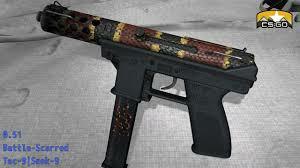 The TEC remains a popular weapon among violent criminals. 18th district cops just got a guy with a tec-9 and a bunch of drugs. That's the 40th gun arrest for Philly cops in the past week. Due to its notoriety, the weapon is still featured in a wide variety of popular media. It has made appearances in incredibly popular video games like Grand Theft Auto and Counter Strike: Global Offensive. Despite not being (legally) made since 1994, the TEC‘s infamy has kept it relevant into the 2010s.